Winner of the 2016 Young Concert Artists International Auditions, Mr. Lee will make a recital debut in Washington, DC, sponsored by the Korean Concert Society Prize on Sunday April 29, 2018, at the Kennedy Center’s Terrace Theater. This performance date is rescheduled from his December 2, 2017 recital, which was postponed due to artist injury. At the age of 15, Nathan Lee’s budding career already earned critical praise as well as standing ovations for performances of stunning musical maturity. Nathan won First Prize in the 2016 Young Concert Artists International Auditions, also picking up fourteen performance prizes. Future engagements include Nathan’s New York and Washington DC debuts on the Young Concert Artists Series, performance with the Buffalo Philharmonic Orchestra on NPR’s From the Top in March 2017, an appearance on Radio France with Jean-Yves Thibaudet in April, 2017, and a performance with the Seattle Symphony performing Prokofiev’s Piano Concerto No. 1 in January, 2018. Nathan has performed with the Cleveland Orchestra, the Minnesota Orchestra, the Coer d’Alene Symphony, and the Ashdod Symphony Orchestra, and has worked with conductors Jahja Ling, Pablo Rus Broseta, Uri Segal, and Mark Russel Smith. He also shared the stage with Jean-Yves Thibaudet and Lang Lang at the Seattle Symphony Galas, raising funds for their music education program. Nathan has given recitals in Korea and the U.S. and has performed in Perugia, Italy with pianists Ilana Vered and Sasha Starcevich in a “Three Generations Concerts” to sold-out audiences. As a Seattle Symphony Young Artist, Nathan performed with Ludovic Morlot and the Orchestra in 2012 and 2016. Other recent achievements include earning top prizes in the 2016 Gina Bachauer International Junior Piano Competition, the 2016 Cooper International Piano Competition where he was also awarded the Audience Prize, and the 2015 e-Piano Junior International Competition. 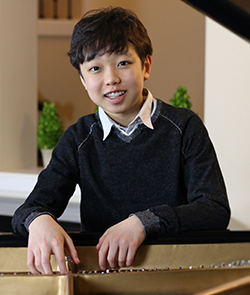 An impressive list of special prizes was awarded to Nathan Lee at the Young Concert Artists Auditions, as follows: the Korean Concert Society Prize, which provides support for Nathan’s Kennedy Center debut, the Paul A. Fish Memorial Prize, providing support for his New York Carnegie Hall debut, and the Ronald A. Asherson Prize. Performance prizes include the Candlelight Concert Society Prize, the Embassy Series Prize, The Friends of Music Concerts Prize, The Harriman-Jewell Series Prize, The Saint Vincent College Concert Series Prize, the Krannert Center Prize, the Sunday Musicale Prize, the Tri-I Noon Recitals Prize, the Usedom Music Festival Prize, the Washington Performing Arts Prize, and the Chamber Orchestra of the Triangle Prize.